Parrots at the entrance to the zoo. They are not in a cage. Wild egret hanging around the manatee pool (looking for a handout). Wild great blue heron stalking the cheetah pond. I've seen one there several times. The food must be good. Pretty bird in the aviary. Boat billed heron in the aviary. I had Monday off so I went to the zoo in the morning. I figured there wouldn't be a lot of people there. I was right. There were also a few animals missing. Keepers were busy cleaning pens so a handfull of animals were not out including the baby rhino and the tigers which I specifically came to see. Lots of birds there though. They have several aviaries that you can walk around and see the birds up close. It's funny to see the wildlife there always looking for a handout. The manatee pools always have pelicans, egrets and herons hanging around wanting to be fed. The penguin pool always has a flock of wild ibis trying to steal fish. There are ducks with babies swimming around the primate pools. I guess if I was a wild animal I would hang out at the zoo as well. Rare sighting of a white morph reddish egret. Marbled godwit going in for a swim. Great egret looking for food and finding himself. I had Friday off so I headed to Fort Desoto park early to see what kinds of birds I could fine. It was a hot sunny morning. There were tons of the usual gulls and terns there as well as marbled godwits, ruddy turnstones, egrets and great blue herons. I was able to get a picture of a fairly rare bird - a white morph of a reddish egret. They are normally dark red from their neck up and dark greyish/blue from the neck down. Occasionally you will see an all white one. They have the same straight beak. He (or she) was prancing around in the water. I got tons of great pictures that morning. Frog family in our shutters. Another beautiful sunset in the backyard. Today was the first day of fall and it was sunny and 93 degrees. Oh well, maybe by December it will feel like fall. We had a quick rain shower when I got home from work. I went outside to see if the frogs living in our window shutter had come out early from the rain. They usually don't come out until it's completely dark. Tonight there were three staring at me. The sun came out for a few seconds before it went down. Osprey couple at Honeymoon Island. Oprey catching a fish at Sawgrass Lake Park. Oprey eating a fish on our dock. I see osprey everywhere. They are very abundant in the Tampa Bay area. When I was growing up and coming down to visit my grandparents here in the 70’s I never saw them on the bridges (or anywhere else). It wasn't until living here in the last 7 years I have noticed they are everywhere. I have a habit of counting how many are on the Courtney Campbell causeway when I am driving home after work. The most I have counted is 22 one day last summer. This summer I have gotten up to 17. In the winter months there are only 3 or 4 on the causeway. Most are eating fish while sitting on the light posts. 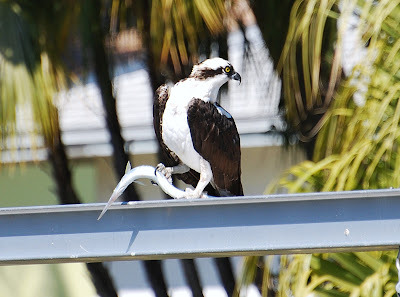 We have an osprey that sleeps outside our bedroom window. Our neighbors have a small sailboat that is docked partially in front of our sea wall and the osprey sits on top of the mast to eat and sleep. Most nights right before dark I can here him calling as he flies up to the mast. Occasionally when I wake up in the middle of the night and can’t sleep I’ll peek out the window and can see him there in the moonlight. He’s usually gone in the morning. Recently a bad storm came through when I got home from work. He had just landed with a big fish that was still flopping around. There was lightning all around. The wind was blowing hard and the osprey flew off and circled around the channel. On his way back to the sailboat he dropped the fish back in the water. He hovered over the spot a few minutes and then flew off. I felt so bad. It was right before dark. I hope he was able to get another fish so he would not have to go to bed hungry. A great place to see osprey nests in the spring is at Honeymoon Island State Park in Dunedin, Florida. The nature trail has nests all along it and some of the nests sit right on the trail. You can see them flying around with fish and sticks to build nests. Fort Desoto in St. Petersburg is another place to see them. There are nests all over the park and we usually see them flying around while we are at the beach. Please don’t confuse the osprey with the eagle. I hear many people say “look at that eagle” when it’s actually an osprey. Just look for the all white chest. Osprey on our neighbor's sailboat at sunset (view from our window). Today as I was coming back from getting lunch I passed a large flock of cattle egrets gathered on the side of the road. Of course I pulled off to the shoulder to get a few pictures since I had my point & shoot with me. I noticed as I pulled off a tractor across the little pond was starting to cut the grass. The birds started to fly over to where he was cutting. He must have been stirring up the bugs. I'm sure he's used to having birds following him around when he's cutting the grass but it looked so funny to me to watch. There was a great blue heron hanging out with the cattle egrets. Laughing gull sitting next to our beach chairs. Cute sanderling running around the beach. These little birds are so much fun to watch. They are so tiny and run so fast on their little legs. Sunday morning turned out to be sunny. We loaded up the car with lunch, beach chairs and umbrella and went down to Fort Desoto in St. Petersburg to spend the afternoon. It was a nice quiet time on the beach. Not many people there. We had a few shore birds walk by so I snapped a couple of pictures. The gull stalked our spot the entire time we were there. No treats for him. The rain moved in later in the day so we left, but not before snapping the below picture of the rain in front of us. Ibis in the front yard. Today it's raining. Not a nice weekend. But yesterday, when I drove out of my driveway going to work this group of ibis where walking from my front yard to my neighbor's yard. It seemed like a big family with juvenile ibis as well. Nice to see the birds on my way into work. There was a wreck on the Courtney Campbell causeway on the way home backing up traffic last night. Since I had my Nikon with me I decided to stop off at the Safety Harbor fishing pier to take pictures instead of sitting in traffic. The sun is already setting earlier so it will be dark on the way home soon. I want to take advantage of the next couple of weeks of sun after work. The tide was high so there were no shorebirds around the seawall. Not many pelicans flying around like usual. They must have all gone to bed early. There was a fisherman on the pier cutting up mullet he had caught and a couple of seagulls flying over head looking for a handout. (The guy did the right thing and did not feed them). I was able to get in some bird flying picture taking practice. They were flying pretty close so I was able to get a few decent shots. When I got home this was in my backyard. It was hot. Even the great blue heron was panting. He was on a neighbor's dock. Tide was very low in upper Tampa Bay. Labor Day was a good day to labor in my kayak. I went out for a couple of hours in the upper Tampa Bay area (near Rocky Point). The tide was really low. I probably could have walked west from Rocky Point along the northern mangroves to the bridge on Courtney Campbell and not gotten my knees wet. I had to stay in the boat channels to keep from hitting my paddle on the ground. Not many birds out in the middle of the afternoon. I did paddle by a great blue heron panting in the heat. No sign of manatees or dolphins. I think the low tide was keeping them out of the area. It was still great exercise though. Caught this sunset out my back door. An osprey was flying by. Blue heron with a fish. I was sitting on a rock watching him and he came close up to me as if to say "See what I have?" before swallowing it. Willet keeping an eye on me. Green heron stalking the beach on Davis Islands. Sunday was a sun day! Brett and I went over to spend the morning at Davis Islands. He rode his bike while I walked around by the airport and the yacht club taking pictures. Lots of people out riding bikes and walking their dogs. I found a few birds looking for food around the jetty. The little blue heron did not seem to be bothered by me sitting on the rocks watching him. He ate at least 3 fish in just a few minutes. There were all kinds of birds out: ruddys, egrets, green herons, blue herons, snowy egrets and several different shorebirds. The only disappointment of the morning was there were no dolphins in sight. Osprey flying high in the blue sky. It's a good thing these birds aren't in a boat. Limpkin in the grass at the Roosevelt Wetlands. There's a great little lake in Pinellas Park called Roosevelt Wetlands. It's small and probably not very deep. There are houses around half the lake. It's amazing how much wildlife is there. Saturday morning I went there looking for the black bellied whistling ducks that have been living there for a while. I had read about it on Pinellasbirds.com. Of course I could not find the ducks. I did see an array of other birds; limpkins, great egrets, great blue herons, osprey, etc. I'll go back in a couple of weeks to look for the ducks. On the way home I drove by the retention ponds that run along the Pinellas county waste plant. Lots of birds there as well. Egret party - snowy and great. Hawk sitting on a utility pole. Roseate spoonbill wading through the trash. Yellow legs looking for crabs. It's funny to see the osprey sitting on the fake owl. Doesn't he know he's suppose to be afraid of the owl and not sit on the dock? I don't think the pelicans are afraid either. Spoonbill sitting on a fence just before sundown. Last night I stopped off at the Safety Harbor fishing pier after work. It was getting late when I got there but got a few pictures. There are usually a lot of pelicans flying around due to the fishermen hanging around but there weren't too many tonight. Not many fishermen either. I did see manatees off in the distance. You could see their snouts and big round tails coming up. The tide was low around the seawall and there were a few shorebirds looking for dinner. They seemed to be eating well. I drove home across the Courtney Campbell causeway and was able to catch this sunset. This has been the view outside my office recently. I'm on the 4th floor. There is a retention pond outside my window (more like a swamp) and a tree just outside. This hawk sits there and looks around for a while. I had my camera in the office yesterday and snapped this. It's through heavily tinted glass so not super great. If he's there after Labor Day I think I may have to name him. Any suggestions? I stopped by Kapok Park on my way home from work tonight. It looked like it was going to rain during the afternoon but the sun came out right as I was leaving work. Not much there in the way of birds. They must have all gotten the memo "It's hot, go north" Even the limpkins which have always been there were not around. Lots of other animals though. Baby snake and dragonflies. The lake is always full of turtles though I did not see the large snapping turtle that is usually hanging around the boardwalk. There were strange fish skimming the top of the plants in the water. Not sure what they are but Brett thinks they may be carp. Any id would be great.